The Nagpur bench of the Bombay High Court has rejected the bail plea of Delhi University professor GN Saibaba, who was arrested by the Maharashtra Police for his alleged Maoist links. The bench has asked the academician, who uses a wheelchair, to surrender in 48 hours, “failing which the police shall arrest him. “The court said that his fundamental rights would be violated if it didn’t grant him bail. The court also took note of the fact that Saibaba is suffering from multiple health problems and needs to be moved around in a wheel-chair. He had dislocated his shoulder and has a crippled right hand due to spinal problems. He was arrested under the Unlawful Activities (Prevention) Act. On 1 July, he was granted temporary bail on grounds of failing health. Saibaba had been in jail since his arrest in May 2014 from the Delhi University campus. HYDERABAD: The CPI (Maoist) sees new opportunities to advance ‘protracted people’s war’ with the Central Government allegedly pursuing pro-imperialist and ‘country-selling’ policies at a faster pace and also advancing a Hindu-fascist agenda in various forms. CPI (Maoist) general secretary Ganapathy, in an interview to Maoist Information Bulletin (MIB), a copy of which is with Express, spoke of the challenges his party has to overcome and on a host of other issues. 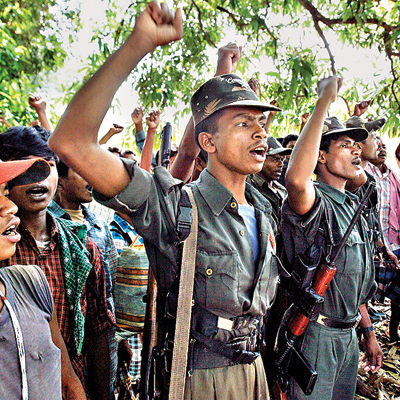 In the past 10 years, Communist Party of India (Maoists) organised as many as 489 training camps for more than 40,000 cadres who have been taught about the use of sophisticated weapons and guerrilla warfare, according to information obtained under the Right to Information (RTI) Act from the Ministry of Home Affairs (MHA). NEW DELHI: At a time when the government is busy with security preparations for US President Barack Obama’s arrival to be the chief guest at the 65th Republic Day celebrations on January 26 here, the Maoists have called out to people to “condemn and boycott” the visit. “In protest of calling him to be the chief guest at the at the Republic Day celebrations, we call upon people to observe 26th January as a day of protest and to boycott all the meetings,” a written statement issued by the Dandakaranya Special Zonal Committee of the CPI (Maoist), dated January 5, said. 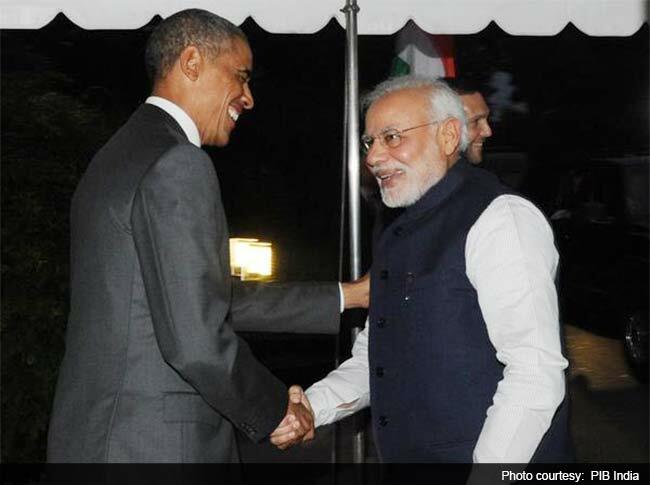 PM Modi with US President Barack Obama at the White House in September 2014. [The year 2014 in India has seen an intensification of the class struggle, mass resistance and democratic activism, armed resistance and revolutionary struggle in growing areas throughout India. And the news has often focused on the state repression, mass arrests and police killings, and the increased incidence and prominence of attacks on women. In two articles here, the police acknowledge the ever-growing role of women in Maoist leadership, as women are now a majority of combat fighters in the revolutionary party and armed units. The first article appeared soon after International Women’s Day (March 8), and the second appeared this week. It should be said that while the police talk of noticing this trend now, women have long played a significant role in the Maoist organization. — Frontlines ed.] ……………. Women commanders have come to constitute almost half of the armed cadre of Maoists and are playing a major role in encounters, like they had done in the Sukma encounter in Chhattisgarh on March 11, security forces believe. It is difficult to get a headcount but a rough number of women killed in encounters last year was available after security forces stumbled upon Maoist posters and pamphlets to pay them homage on International Women’s Day. 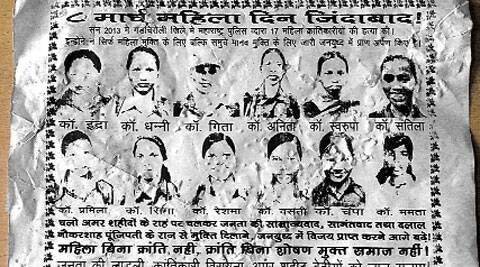 One poster in Gadchiroli district in Maharashtra paid homage to 17 women commanders killed in encounters over the year. In the past one year, there has been a significant increase in women joining the armed wing of Maoists. Maoists do not leave behind their dead and take away the bodies. The posters enabled security forces to get a headcount. Posters recovered from Gadchiroli identified some of the women as Indra, Dhanni, Geeta, Anita, Swarupa, Santila, Pramila, Seema, Reshma, Vasanti, Champa and Mamta. It said, “mahila bina kranti nahin, kranti bina shoshan mukt samaj nahin (no revolution without women and without revolution there can’t be an exploitation-free society). In the March 11 encounter in Sukma in Chhattisgarh where 15 security personnel were killed, women Maoist commanders played a role, according to the Central Reserve Police Force (CRPF) which lost 11 men. The state police personnel lost four men. In a presentation to the MHA, the CRPF had said Maoists were divided into three groups, and one group comprised mainly of women commanders in black uniform who fired from behind. After a drop in male recruits and desertion, Maoists have started recruiting women on a large scale. The CPI (Maoist) leadership has of late effected a radical structural change in the outfit by drafting more and more women cadre in combat roles besides ensuring their fast rise in the rebel hierarchy, intelligence sources said on Monday. Electioneering on flex boards. Pictures of the Maoist advocate’s posters are not published in the Indian bourgeois press. While most of the flex boards were seen in Kallamala region of western Attappady on Friday morning, a few were installed at Poonchola and Pambbanthode villages close to Mannarkkad. The boards claimed their ownership to a special regional committee of the CPI(Maoist) Western Ghats unit. The boards said the organisation was observing the 10th anniversary of its armed resistance and sought cooperation of the general public in strengthening the party base in the three southern States. It wanted strong public vigilance against concerted efforts of the ruling class to plunder water, land, forests, and natural resources.